PELOSIA: “I DON’T THINK PEOPLE WANT A NEW DIRECTION” | "Global Possibilities"
We recently discussed how Democrats seeking the removal of House Minority Leader Nancy Pelosi were called “sexist” for merely seeking change after the disastrous 2016 election. Democratic leaders engineered the primary selection of Hillary Clinton despite polls showing that voters did not want an establishment figure and had deep seated misgivings about Clinton’s honestly and integrity. One of those leaders who has been most criticized over the years has been Nancy Pelosi. However, democratic members overwhelmingly elected Pelosi again as minority leader in what was seen as a slap in the face of those who want to see serious change in the party. Within a couple days of her reelection, Pelosi went on the air to declare that everyone is wrong and people really do not want a new direction. They want the same leadership like her to pursue the very same course that has led to historic losses under her leadership in the House. It was the same dismissive logic applied by the Democratic National Committee and Democratic leadership (including Pelosi) in engineering the nomination of Hillary Clinton, the ultimate establishment figure when polls showed an overriding preference for an outsider and record low favorability numbers for Clinton (particularly on issues of honesty). The question is whether the obvious anger inside and outside the party will galvanize into continued opposition. The establishment seems to be betting on people forgetting about serious reforms or wanting other options than the current duopoly of power held by the Republicans and Democrats. Retaining the very same leadership in both parties may be just what reformers had hoped: a clear signal that any changes in Washington will require the continuation of the popular movement seen in the last election. After losing what was viewed as highly promising election for the Democrats (in part due to the selection of a candidate that Pelosi pushed), the answer seems to confirm that the party remains the domain of the party elite and not the voters. Just to recap: the Democrats lost 63 seats in 2010 and, while the election of President Obama picked up seats, they were defeated again in 2014. She was retained despite polls that showed her as the least popular figure among the Democratic leadership. Many believe that Pelosi, 76, and other leaders are both unpopular and associated too closely with the ruling establishment in Washington. Some members have grumbled that Pelosi seemed clueless in blaming Comey, millennials and others after predicting on election night an easy win for Clinton, a Democratic takeover of the Senate, and a significant gain of seats in the house. Pelosi and the other top Democratic leaders will be in their 80s when the Democrats have another serious chance at retaking the House. (Notably, Joe Biden suggested today that he also will be back and is seriously considering a run for the presidency in 2020 when he will be 78 years old). Saying that the election was simply not educating voters or getting their message through is basically saying that voters are misinformed about the wisdom of the Democratic leadership. The fact is that Hillary Clinton spent a record amount on the campaign and twice the amount per vote spent by Trump. The Democrats had the bigger campaign, the greater campaign coffers, and the overwhelming support of the media. Yet, Pelosi says the problem is that voters did not understand their message rather than the message itself (or the messengers). That spin ignores that the Democrats have, over that period, lost a massive number of seats and made them little more than a passing irritant for the GOP in the House. For many, the interview highlights why Pelosi has been so unpopular in polls for over a decade. The leadership is refusing to accept that they are part of the problem or that there is really widespread discontent after the ultimate outsider just secured a historic upset over perhaps the greatest establishment figure in the Democratic party. Washington however views elections differently than the public. Leadership positions protect fixed interests for members who want committee positions, campaign funds, and other benefits. Even a losing leadership can supply those benefits if you are inside the tent. So one has to use a translator in such interviews. What Pelosi really meant is that “I don’t think that establishment wants a new direction” and she is clearly right. I think the same advice applies here. The Democratic Party dehumanizes and dismisses any other political party. Disagree with them, and get ascribed evil tendencies, which a surprising number of people actually believe. But they take the same attitudes towards their own members, as well. Clamor for change from within, and you disagree with them – and get the usual ad hominem attacks of sexist, etc. Even longtime Democrat Richard Dreyfuss was almost drummed out of Hollywood when he attended a Ted Cruz rally out of curiosity. He had to prove his allegiance before they’d release his throat. When a Party so viciously turns on anyone who disagrees with them, they’ll turn on their own. If they don’t care what matters, hurts, or affects people of other political persuasions, they won’t care about negative consequences for their own. If they don’t care about the catastrophic financial losses that Obamacare caused to the unsubsidized Middle Class individual policy holders, then they won’t care how staying the course negatively affects their own. In a similar fashion, they have shown denial and disdain for all the businesses closing or moving, and the jobs lost, by applying a massive, one size fits all minimum wage increase across an entire state that has cost of living averages ranging from the impossibly expensive San Francisco to the struggling Yuba City. They just take the position that those who were already struggling financially who lost their jobs to shut up and keep voting Democrat, or they’ll be branded racist/bigot/anti-Semitic, etc. The Duopoly has gained too much power and is becoming a two headed tyrant. Hence the popularity of a Populist candidate who may, or may not, improve things. This was an opportunity for the Duopoly to realize its mistakes and be called to heel to the people, but if they squander that learning opportunity, they will be replaced. Surreal form of populism where billionaires and Goldman execs are chosen to govern…. One might call it “faux’ populism or the best con job ever. It’s not surreal. It takes what the bourgeois segments say about the country in which they live and turns the tables. Trump said two things: this is a country and not a hotel. Anyone who settles here has to meet standards set in public policy informed by public opinion. Anyone who settles here in violation of public policy gets deported. For the most part, elite opinion has formed a cartel to keep this issue off the agenda and to employ various games to keep it from being discussed and to keep solutions from being implemented. Trump prospered by shaking his fist at elite opinion. Also, for 50 years or more, public discourse has been distorted and disfigured by gamesmanship wherein ethnic particularists and the liberal establishment prevent discussion of issues through displays of indignation. Generally, Republican politicians have responded with craven apologies when the media try to stir up trouble. Trump moved the Overton window by refusing to apologize. The media – DNC – academic complex responded by calling his supporters ‘deplorable’. His supporters haven’t had anyone speaking on their behalf (leaving aside perhaps Mayor Giuliani or Mayor Koch or Louise Day Hicks in local areas) in a couple of generations. Whatever direction Pelosi and Company think they are going in does not seem to be aligned with the rest of the country. Olly: I agree with you 100%. I’m happy that the Dems are clueless as to why they lose, lose, lose. I smile when they blame messaging, racism, gerrymandering, money, media, on and on and on. The more they blame someone and something other than their own incompetence, the more they lose, lose, lose. 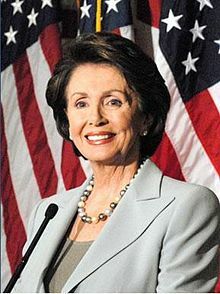 Congrats Ms Pelosi !!!! Long may you rule. I think JT is forgetting that the reason has so few Democrats and so many Republicans are in the House is because the Republicans in the states have systematically redistricted their states so that more Republicans win. The Democrats do the same thing, but the Republicans at local and state level have had a plan for decades and, where their own power is at stake, they are able to follow through. When there is a balance between Rs and Ds, the redistricting is done to protect their own seats with few up for grabs. So it isn’t all Pelosi’s fault, however, new leadership is a great idea. Shhhhh….. don’t mention gerrymandering on an r forum. Go ahead, mention it. It’s an excuse your lot favor. It is not an explanation. Gerrymandering provides less of a premium to Republicans now than it did to Democrats 30 years ago and Democrats have, in any case, lost the House while winning pluralities of the popular vote just twice. In neither case (in 1998 and 2012) did they win a majority of the popular vote and the plurality won in 1998 was tissue-paper thin. Your problem is obvious: your votes are comparatively less efficient because you run up 6-1 pluralities in inner city districts and lose by more modest margins elsewhere. That’s just how your support is arrayed geographically and there is nothing to be done about it (unless you propose to chop up inner city zones into little wedges to salt surrounding districts with inner city voters – i.e. you gerrymander). Add some voter suppression into the mix too. McCrory was so unpopular that that did not even work for him. “Voter suppression’ is another fiction. Keep it up. The more you lie to yourself, the less effective you’ll be. For pity’s sake, gerrymandering affects everyone. I could not vote out a Republican rep who I disagreed with because of redistricting. And I often vote Republican. The elected elites want to stay in power, no matter the party. They represent themselves far too often, and gerrymandering reinforces that goal no matter the party. Dave – as I have explained, the DoJ has to approve the redistricting plans of 20 states per the Civil Rights Act. Those are set out to get a one man one vote, plus protected districts for minorities. For instance, Phoenix, Az does not vote for a single candidate but rather has been split into 6 districts. And since Arizona continues to grow, we continue to get districts, meaning every 10 years they have to resplit it again. Arizona is always shorted representatives, but there is nothing we can do about it. Every political party allowed to draw the lines favors their own party. That’s a problem no matter who does it. But neither party can resist the temptation. I would like districting to be fair and impartial. But how to draw them without being partisan? It’s not difficult to craft a practice manual which will limit the number of discretionary cuts and distribute discretion to convocations of municipal and superior court judges rather than have the state legislature or a state commission make all the cuts. One thing you have to give up is an insistence on strict equipopulousness. That’s been imposed by the courts and it’s bad. I’ve experimented with this homebrew method drawing sample districts for the New York State Assembly with 1990 census data. New York has 150 seats in its assembly. You can at least work it so you assemble the state’s 62 counties into a smaller number (40, as I recall) first order constituencies amongst which you apportion seats. The resident population for all but two 1st order constituencies were in my experiment within 8% of the statewide mean. The first-order constituencies would then be divided into single-member constituencies. There’d be more variation in the population of these single-member constituencies, but you’re still looking at only a single-digit % which are underloaded or overloaded by more than a modest degree. Iowa practically does it by county. It almost entirely looks like a grid. Not sure of the exact process, though. It’s political malpractice not to do it. bettykath – some 20 states are under the Civil Rights Act concerning redistricting. All of those state voted Republican. Can I ask an unrelated question? Does it bother anyone else that Obama will be milking the taxpayers for yet one more luxurious mulit-million dollar Hawaiian vacation again this year? The Obama’s vacation in luxury for over 6+ weeks a year and Barry plays golf nearly every weekend. Not to mention all the Aspen ski vacays and European getaways for Mrs O. Plus all the celebrity dance and rap parties and private concerts with Prince they have hosted at the White House all these years. Tally for taxpayers: in excess of $85 million dollars. Obama has taken every advantage available to him b/c of the compliant media. And he has used Air Force One to fly around the world and check off every item on his bucket list he ever wanted to see. Where is the outrage? Talk about being protected by the press. I think that the President should be limited to 2 weeks vacation, 3 weeks tops, just like the rest of us. If he wants to save vacation days, I have no problem with them rolling over. Working from another location, like one of his or her homes, shouldn’t count as long as they are punching in. There should be similar limits to vacation as any company or union imposes on its employees. Agree! The myth that Obama works SO hard reading and studying and analyzing into the wee hours is what we call “Propoganda”. The reality? He is milking it as far as he can get away with it –luxury vacays with the hoi polloi on “the Vineyard” and all these nearly 3 week Hawaiian holidays where the secret service stays in high end hotels on Waikiki Beach (look up the rates taxpayers are paying for Moana Surfrider, etc) and then they follow POTUS around as he snarls holiday traffic for the locals and shuts down all the major private golf courses to accommodate ‘his highness’. A friend’s husband is in the Coast Guard on Oahu and you don’t want to get him started talking about Obama and the mess he makes for the locals -who are also trying to enjoy their holidays- despite the massive disruption by the oh-so-self-important POTUS milking the US taxpayers for all he can get away with. Where’s my barf bag? Harry Truman conducted the most consequential diplomacy of the post-war period. He traveled outside the United States 3x in 8 years: once for a courtesy visit to Mexico, once for a courtesy visit to Canada (which could have been reached by car), and once for the Potsdam Conference. This notion you have to have the President circling the globe (with four planeloads to hold the limousine and the entourage) is just insufferable. The notion that you have to broadcast the president’s movements in advance is behind the clanking and enormous security cordon around him. I believe Trump will do things much differently than Obama. First of all, Trump has his own plane, so the thrill of flying around the world on Air Force One as often as he could – as Obama has done for 8 years -is not even on Trump’s radar. Unlike Obama, I believe Trump will stay put much more often and actually do the hard work of the people -whereas Obama spent a lot of time playing golf and throwing private celebrity parties at the White House. This is why he paid a PR staff something like $600k a year – to keep the masses fooled. The taxpayers are on the hook for the Trump fiasco in NYC. Wonder if Melania will ever move? Why should she? To be hated on by the media? I’d stay in NYC and protect their 10-year old son if I were her. The Trumps will not be taking 2 months of luxury vacations every year as the Obama’s have done. Trump will be working hard. And every little thing he does will be attacked by the dogs in the press. They coddled their pet Obama family. Not so with the Trump family. It’s kinda like how the press doesn’t highlight the wealthy lifestyle that Nancy Pelosi enjoys. Do you think most voters know that Pelosi lives on a sprawling vineyard estate just north of San Francisco and is worth close to $30 million? Probably not, b/c the media only focuses on those big, bad, rich Republicans. And don’t get me started on Harry Reid’s extreme wealth through ‘public service’. To my view that’s one big difference – so many Dems (Clintons come to mind) in “public service” became uber wealthy. Whereas so many of the Republicans became wealthy through commerce, businesses that created jobs and innovation. There’s a big difference there. Extreme wealth via “public service” is also known as “corruption” and there’s plenty of that to go around in Dem circles. Give him a vacation as far away from the levers of power as possible. How about Bali? Too nice – don’t ruin it! The Republicans screwed the grassroots support of Ron Paul, and they paid the price…now the Dems try the same thing….with the same result…. I’m just too sad/infuriated to comment anymore…. There is one huge flaw in both Pelosi’s basic argument and your argument Prof. Turley, which is that the Democrats got a lot more votes than the Republicans did. The Republicans, ironically, are even more unpopular than the Democrats are. So the basis of both arguments has this huge flaw. The reason Clinton lost was both strategic and tactical. First, she was indeed the wrong candidate and unpopular and one who was so very unpopular she actually turned voters off who would have voted for almost any other candidate. But she did, indeed, win the election. She only lost the antidemocratic electoral vote because she ran a rotten campaign that didn’t get voters to the polls in three critical states which her much heralded Clinton machine took for granted. So, despite the weakness and unpopularity of Clinton, had she run a decent campaign purely in terms of mechanics with the $1 billion she had to fund it she would have been President. That would not have changed the essential mood of the nation and the vast majority of our people who are enraged at the ineptitude, avarice, dishonesty–even criminality of our elites in this new gilded age that impoverish our communities and our families while pursuing ruinously expensive imperial oil wars abroad. There is one huge flaw in both Pelosi’s basic argument and your argument Prof. Turley, which is that the Democrats got a lot more votes than the Republicans did. The Republican tally in House races exceeds the Democratic tally by over 2 million votes. This woman is a bird brain. I am not a Democrat, but congressman Ryan from Ohio seems like a ntratj of fresh air. Thats Breath of fresh air. Sorry.